Cairo: Egyptian President Hosni Mubarak, charged with the killing of protesters and abuse of power, was wheeled into court on a hospital trolley on Wednesday as his trial resumed after a delay of almost two months while lawyers demanded a new judge. Many Egyptians hope the trial will heal some of the scars of his autocratic rule and help the country find stability after nearly a year of political turmoil under the military generals who replaced him in power. 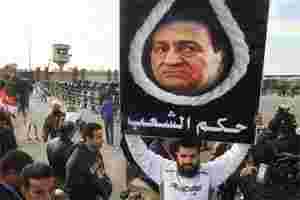 Mubarak, his two sons, the former interior minister and senior police officers face charges ranging from corruption to involvement in the deaths of hundreds of protesters in the uprising that unseated him. “The court has responded to all the defendants’ lawyers requests," said lawyer Khaled Abu Bakr, who represents families of people who died in the uprising. “Egypt has guaranteed for Mubarak a very fair trial, the judge has ensured that all the basics of justice are there ... no one should object the final verdict"
The former leader, who is being held under guard at a military hospital near Cairo because doctors say he has a heart condition, was brought into the court on a hospital trolley, covering his eyes with his arm and surrounded by police. Previous sessions were marred by clashes outside the Cairo court building between Mubarak supporters and Egyptians demanding the death penalty for him, but there were no scuffles when Mubarak arrived on Wednesday. He was widely believed to be grooming his son Gamal to succeed him but any such plan was overturned when disgust at poverty, corruption and the brutality of Egypt’s security forces boiled over and millions took to the streets in January. Around 850 people were killed in the 18-day uprising that overthrew him, with the police accused of shooting live rounds at unarmed demonstrators. Much of the trial centres on who gave the order to fire. The case has gripped the Middle East, a region ruled mostly by autocrats who seemed unassailable until this year when Mubarak and the leaders of Tunisia and Libya were toppled in popular revolts. The sight in August of Mubarak, the man who ruled the Arab world’s most populous nation for three decades, appearing behind bars in a Cairo courtroom on charges that could bring the death penalty was one of the defining moments of the Arab Spring. Later that month the presiding judge Ahmed Refaat ordered television cameras out of the courtroom until the case concludes, ensuring key testimony by top officials took place beyond public view. Lawyers for families of the dead filed a suit in September calling for Refaat and the two other judges to be replaced. They had complained that the judges had failed to give them enough time to question Field Marshal Mohamed Hussein Tantawi, who heads the ruling military council, during his court appearance. Their request was rejected. Former interior Minister Habib al-Adli and six senior police officers are also standing trial. Businessman Hussein Salem, a close associate of Mubarak, is being tried in absentia. Lawyers asked that the deputy head of the military council, General Sami Anan, give testimony, and also Major General Naguib Mohamed Abdel Salam, former commander of the Republican Guard. Abdel Salam was ordered by Mubarak on 28 January to send Republican Guard troops to surround the state television building in Cairo, said Mohamed Gendi, lawyer for Ismail Sha’er who headed the state security services and is one of those on trial. “We request to know what orders Major General Abdel Salam received from Mubarak. Were the orders to use force with protesters or just to protect the TV state building?" said Gendi. The lawyers also asked for the former head of the National Security Authority, Mostafa Abdel Nabi, and Major General Hamdi Badeen, head of the military police, to appear as witnesses. The judge gave no response to the demands before calling the session to a close. He set 2 January for the court to reconvene. The case is a test for the army, which may be uncomfortable at the prospect of a public humiliation for Mubarak, a former air force head. Whatever the outcome, his overthrow ensures his successors cannot ignore the power of the public. But those who hoped that the revolt would lead quickly to a return to stability and an improvement in their lives have been disappointed. Egyptians began choosing a new parliament a month ago in elections due to last until mid-January, but the vote has taken place in the shadow of violence and an economic crisis. Protesters demanding the army cede power more swiftly fought troops in Cairo for five days until calm was restored last week. The Health Ministry put the death toll at 17. The Muslim Brotherhood, whose party is leading in the election, said the army’s timetable for handing power to civilians after a presidential vote, due before mid-2012, should not be changed as it would cause chaos.